With the 1997 model year the Grand Prix celebrated its 35thanniversary. And what better way to do that than with an all new design. Pontiac fans got a sneak preview of the new GP by watching the NASCAR Winston Cup races. The original Grand Prix debuted in 1962 as Pontiacís answer to the four placeT-Bird, which began the start of the personal-luxury coupe market segment. Helping the GPs introduction along was Buick getting the nod from GM to buildthe new E-body coupe. Pontiac thought it was going to get the new design andwhen they found out they didnít , they went ahead and designed theirpersonal-luxury coupe form the existing B-body. The rest is history! There were many generations of the Grand Prix. The '62 model was the first. The '63-'64 was the second. '65 to '66 was the third. 1967 and 1968 werestand alone model years, so they would be the fourth and the fifth,respectively. The '69 through '72 model was the sixth generation . The'73-'77 was the seventh. 1978-'80 was the eighth. 1981 through 1987 broughtus the ninth generation. And the current generation, started in 1988 andrunning until 1996, is the tenth. When the new GP arrives in the Fall, itwill be the eleventh generation. 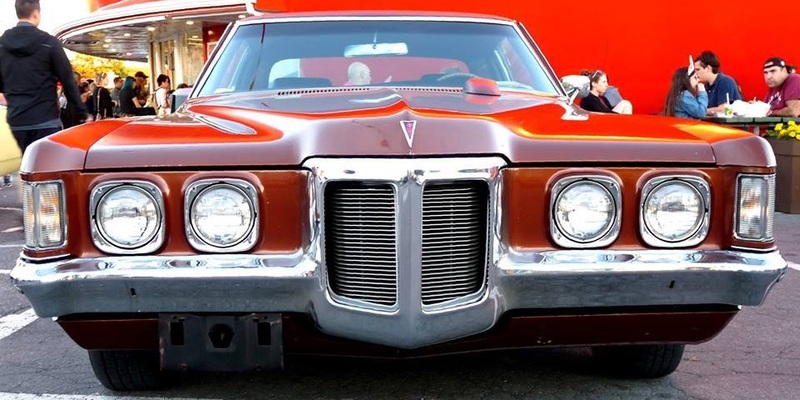 Now the Grand Prix may not be the fastest or most recognizable Pontiac, itmust be given its credit in the Pontiac hall of fame. The GP could be hadwith an engine from a GTO and a suspension specially designed for touring. Itwas the best of both worlds. It has often been said that the Grand Prix is aworld class athlete in a fashionable tuxedo. --- All of the 421s were built between 7/27/62 and 8/9/62. All wereRoto-Hyramatic, 4 barrel cars. This engine replaced the 425-A-Trophy 389,which was dropped towardthe end of the model year. Some of these 421s were reputed to be early 1963 421 H.Os. --- All of the 16 421 S.Ds were dual 4 barrel cars and all had the Borg-WarnerT-10 4 speed manual transmission. Of the 16, 5 were painted dark burgundy with onlyone of those havingthe parchment interior. This particular car is the only one known to havesurvived.It appears as the 1st of the 16 had factory A/C and a 3.42 axle and thatthe 15th had a non-posi axle and special paint. --- Of the 3 '63 S.Ds , 2 had aluminum front ends and both of those had the405 HP dual 4 barrel421. These were the 1st and 3rd cars. The middle car had a steel frontend and the 390 HPsingle 4 barrel 421. All 3 had the heavy duty 4-speed manualtransmission. None of the 3 arethought to survive today. Because of GMís ban on corporate racing at theend of '63, the421 S.Ds were never produced after 1963. --- Of all the 1964 production, 3,124 were equipped with a manualtransmission. --- Of all the 1965 production, 1,973 came with a manual trans. The rest camewith the new for'65 M40, Turbo-Hydramatic 400. --- Of all the 1966 production, only 917 were ordered with a manualtransmission. 1966 wouldbe the last year Pontiac offered Tri-Power. --- 1967 was the only year a convertible GP was offered from the factory. --- All Pontiac V-8s were revised in 1967. Due to bore increases, the 389became the 400 andthe 421 became the 428. --- Pontiac also used new cylinder heads with completely redesigned ports andlarger valves. --- The spreadbore Quadrajet was introduced replacing Tri-Power. --- Of all the 1968 production, just 306 came through with manualtransmissions. --- 1968 marked the last year that the Grand Prix was based on the full sizeB-body. --- Model designations ìJî and ìSJî were taken from Dusenbergs (the 'J' beingthe regularmodel and the 'SJ' being the supercharged models). Pontiac only followedthesedesignations in nomenclature only. The ìSJîs referred to a sportier GP. --- Of the 1969 production, 1,014 G.Ps came with a manual trans. and just 676of those were4-speeds. --- In 1970, the 455 made its debut replacing the 428. --- Of the 1970 production, only 500 came with a manual trans. and only 329 ofthose were4-speeds. --- For 1971, compression ratios were dropped in the line leaving just 1 400and 1 455. --- Of the 1971 production,only 116 came with a manual trans. and just 58 ofthose were4-speeds. --- The TH-400 became the standard transmission in March of '71. --- For 1972, the manual trans. did not make it back. The automatic was theonly choice. --- In 1973, early Pontiac literature shows that the 455 SD was to be anoption. Just beforelaunch of the '73 models, the SD was pulled from the option list. --- In 1975, unleaded gas and catalytic converters were required. Also, theHEI ignition debuted. --- In 1976, the special 50th Anniversary edition GP was an LJ paintedgold,with special hoodand trunk emblems and striping,and included removable T-tops. It wasreleased inrecognition of Pontiacís 50th anniversary. --- 1977 marked the first year that a non-Pontiac engine was available in aGP. --- 1978 marked the first year that the GP did not come with a Pontiac V-8 (orany V-8,for thatmatter) as standard engine. --- A manual transmission returned in 1978. --- The Buick 231 CID V-6 was the standard engine in 1978. --- In 1978,the GP debuted in an all new G-body that was 700 pounds lighterand 17 inchesshorter than its predecessor. --- For 1979, a 4-speed manual transmission was available as an option. ** The production numbers of the Sterling Edition of 1980 are unknown at thistime but they are believed to be a very limited production Grand Prix. At this time, the production breakdowns for the rest of the model year GrandPrixs are unknown. I am working to get the rest of them. I have compiled somenotes for the remaining years. 1981 -- The Model SJ was dropped and a more luxurious version of the GP wascreated. It was called the Brougham. This year also marked the last year inwhich a Pontiac V-8 would power a Grand Prix. The GP was redesigned this yearwith a definate wedge look. 1982 -- The only V-8 offered this year was the Olds 350 diesel. 1983 -- The General Motors ìCorporate V-8 became available. This was really asmall block Chevy. 1984 -- The LJ moniker was replaced with LE. A 4-speed automatic transmissionwas made available for the first time in a GP. 1985 -- Only trim changes for this year. 1986 -- In order to be more competitive in NASCAR racing, Pontiac introduced aspecial version of the GP called the Grand Prix 2+2. In order for thisspecial car to be legal on the racetracks, it had to be released to the public. Itincluded a special sloped nose, bubble rear window,large front spoiler,rear spoiler,and specialpaint that consisted of a silver top and a gray bottom divided by a red stripe. RichardPetty and his team helped Pontiac develop this special car. Underneath the specialbody though,the 2+2 was standard GP fare. Production of the 2+2 equaled just 1,118units. Only trim changes for the rest of the line. 1987 -- Again,only trim changes this year. 1987 marked the last of the G-bodyGrand Prixs and the last of the rear wheel drive Grand Prixs. 1988 -- The new GP was introduced this year. It was the first front wheeldrive Grand Prix ever. It was based on G.Ms all new GM-10, W-body platform. Therewere 3 trim levels; base, LE, and SE. The only engine available was a 2.8liter V-6 with either a 4 speed auto or 5 speed manual trans. 1989 -- The 2.8 was stroked to 3.1 liters,but this engine was only availablewith an automatic. The 2.8/5-speed combo remained. Bowing to outside pressures,Pontiac finally introduced a high-performance version of the new GP. It was abasic car that was fitted with Pontiacís new 3.1 liter turbochaged V-6 and thenshipped to McLaren/ ASC for final conversion. It consisted of the turbo V-6,special4-speed auto trans, special suspension and wheels with 245/50R16 GoodyearGatorbacks,and extensive aero body cladding. All of them were red and it was produced invery limited numbers. 1990 -- This year marked a couple of firsts for the GP. 1990 was the firstyear a 4-door Grand Prix was offered and the first year a 4-cylinder engine wasavailable. It was the 2.3 liter Quad-4. Trim levels became: LE coupe and sedan, SE coupe,STE sedan,and the McLaren/ASC Turbo coupe. The turbo coupe was again all red andlimited production. 1991 -- The turbo coupe was dropped this year. It was replaced with the GrandPrix GTP. The GTP offered everything the turbo coupe had but had the the turboengine replaced with the 3.4 liter, 4 cam V-6. All noses on all the coupes wererestyled. The STE sedan also had the 3.4 V-6. A GT coupe was also available. It was justlike a GTP but the regular 3.1 V-6 replaced the 3.4 V-6. The LE coupe wasdiscontinued. 1992 -- Just trim changes for this year. 1993 -- No changes this year. 1994 -- Pontiac simplified the GP line-up for '94. There were just the coupeand sedan. If the 3.4 V-6 was ordered on the sedan, it was called the GT. In thecoupe,it was called the GTP. Otherwise,there was just the SE with the 3.1 V-6. A SpecialEdition Coupe Package made the SE coupe just like the GTP coupe but with the3.1 V-6. The aero cladding on the GTP and Special Edition SE coupes were cleaned upslightly and the dashboards were redesigned incorporating dual air-bags. 1995 -- 1995 saw just trim or package changes. 1996 -- All coupes received the aero cladding as standard equipment. Only trimor package changes otherwise. 1997 -- All new Grand Prix due in Fall of '96. Look for a hot 240 HPsupercharged V-6 as top engine in GTP. Stay tuned. Many thanks to Mark DeCarlo for the above information. If you would like to send him a comment go to his contact page.